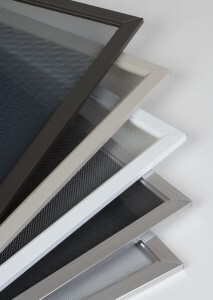 Most replacement screens, new windows and doors come with standard fiberglass screening. It is flexible, economic and easy to install but they are more susceptible to damage than our charcoal aluminum screens. For that reason, we highly recommend using charcoal aluminum screening. It is stronger and more durable than traditional screening. Along with its ability to keep insects out, it resists rust and does not sag. It also has a protective finish that prevents corrosion and strengthens the weave. The charcoal finish reduces glare for greater outward visibility. Not only is this a great upgrade to your windows and doors, at 1 cent per square inch, it is one of the most affordable upgrades you can make to your home. So take advantage of our great rates and call us at 718.984.1300 or 718.984.2400 for an appointment.